Present-day distributed plate deformation is being mapped and simulated in great detail, largely based on satellite observations. In contrast, the modelling of and data assimilation into deforming plate models for the geological past is still in its infancy. The recently released GPLates2.0 software provides a framework for building plate models including diffuse deformation. 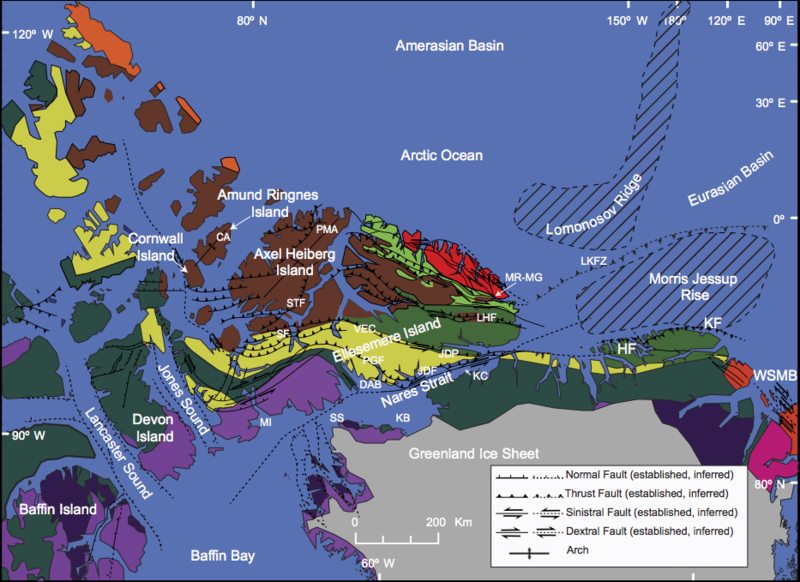 In a paper in Tectonics Auston Gion from the Department of Geology, University of Maryland, and EarthByters Simon Williams and Dietmar Müller present an application example for the Eurekan orogeny, a Paleogene tectonic event driven by sea floor spreading in the Labrador Sea and Baffin Bay, resulting in compression between NW Greenland and the Canadian Arctic. The complexity of the region has prompted the development of countless tectonic models over the last 100 years. The new tectonic model incorporates a variety of geological field and geophysical observations to model rigid and diffuse plate deformation in this region. Compression driven by Greenland’s northward motion contemporaneous with sea floor spreading in the Labrador Sea, shortens Ellesmere Island in a “fan” like pattern, creating a series of thrust faults. Our model incorporates two phases of tectonic events during the orogeny from ~63-35 Ma. Phase one from ~63 to 55 Ma incorporates ~85 km of Paleocene extension between Ellesmere Island and Devon Island with extension of ~20 km between Axel Heiberg Island and Ellesmere Island and ~85 km of left-lateral strike-slip along the Nares Strait/Judge Daly Fault System, matching a range of 50-100 km indicated by the offset of marker beds, facies contacts, and platform margins between the conjugate Greenland and Ellesmere Island margins. Phase two from 55 to 35 Ma captures ~30 km of east-west shortening and ~200 km of north-south shortening from Ellesmere Island to the Canadian Arctic Island margins. Our model extends the boundaries of the Eurekan Orogeny northward, considering its effect on the Lomonosov Ridge, Morris Jessup Rise, and the Yermak Plateau , favouring a model in which the Lomonosov Ridge moves attached to the Pearya Terrane. This model illustrates that key regional geological and geophysical observations are compatible with the relative motions of Greenland and North America constrained by marine magnetic anomaly and fracture zone identifications. This deforming plate model offers a platform and base model for future research.